I love these colors, I only wished the weather matched this quilt! I quilted this with a loose meandering pattern & its bound with a Moda solid. Those little dog blocks (fabric by Heather Ross) are my favorite. And no they’re not deer….although yes a couple of them look like deer. :) This one is for sale in my etsy shop, unless I can convince myself that my boys need one more quilt to add to the 15-ish they already have. The back is pieced with strips of an Amy Butler print and some matching pieces from the front. It measures 37.5″ x 53″. You have inspired me to try this combo out. Your quilt came out so great! Lovely! I'll have to keep that on my "to do" list. Very warm colors, and I like the wide meandering quilting. Well done. It's fun and fresh. A real beauty! I like adding orange to a quilt, it's such a happy colour. so fresh and modern..I love the dog fabric blocks. beautiful work! Two colors I wouldn't have thought to put together. Love it! Geez I need to learn to think outside the box. I just may have to do one like this for my daughter's room. lovely! love all the white! Gorgeous! 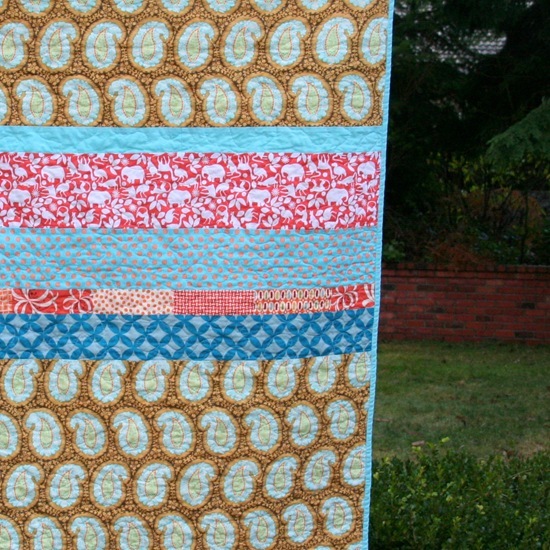 Do you (or does anyone) know what line that aqua and orange stripey vine fabric is from? Love it! What a great quilt! just lovely. 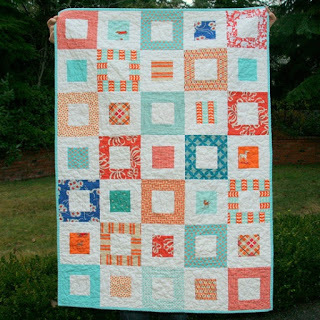 Allison – love this quilt! I need to make 3 baby quilts for some teachers at my school and this one will be great! Love the way you've set up your website. I need to put some tutorials on mine. Hey Allison. This is so bright, clean & fresh. It reminds me of the beaches and Indian River oranges (here in Florida). It's really beautiful. Gorgeous. Especially welcome on this rather chilly day here in Vancouver. Love your blog – thanks for the awesome tutorials. Beautiful! Where do you find teh time! Wow, I love, love, love it! Not at all something that I would have thought of, but I will probably be dreaming of this quilt tonight!!! It's a beautiful combination of colour. Makes me want summer! You are so inspiring. I love it. The colors are great and I am thinking I will have to make something similar for my hubby. Thanks. Really beautiful! Of course, I love the front, but the back is spectacular too! I selectively used that orange dog print on my last orange/aqua piece too. It was perfect for the recipients as they have a greyhound. Love it!! Very bright, cheery, playful, and refreshing. Well done. Well done it it gorgeous and I love it that you also used strips on the back.It makes it so much more interesting. Love the colors and materials. I better get started I just became a great grand mother to a handsome baby boy Jakob Ryin. love the quilt!!! love your blog, thanks for all the inspiration!! Beautiful! I have one of these patterns in the works in green and blue and hope it turns out as well as your did! Just fab! My current favorite color combination! This quilt looks absolutetly amazing! I love the pattern and the colours. I'll have to keep that on my "to do" list.